Fill a 9×13″ pan with some seared ground beef seasoned with salt, pepper, and rubbed sage; its fond deglazed with a little beef stock; a few tablespoons of Worcestershire sauce; some Trader Joe’s frozen roasted sweet corn; a boatload of buttery, creamy mash; and a veneer of coarsely grated strong cheddar. Bake at 375F/190C for 50-55 minutes until it’s piping hot and the cheese is coloured perfectly, comme ci. Eat in front of fireplace. Make monosyllabic comments sprinkled with grunts to taste. 1. Click for a larger view 2. Try not to become fixated. 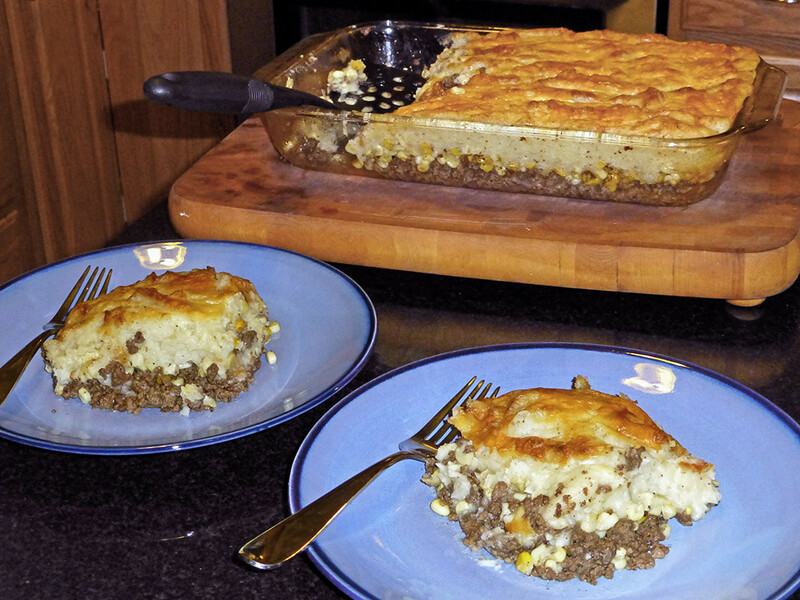 This entry was posted in Cooking, Recipes and tagged cottage pie. Okay. I see only two plates there. How in god’s name lalo do you keep from, you know being tempted to go back again and again for another helping ? Because that is one very large cottage pie. Enough for an army. Either that or for two people that are a two person army in daily basic training regime. Either that or you have some special DNA that keeps you from blowing up to the size of a minivan. Funny, I was just listening in the car to an older “The Gist” podcast, and it was about delayed gratification, aka self-control. Though I tend to be Mr. Delayed Gratification generally speaking – hence my interest in slow-cooking and trying to buy things like fireplaces and furniture only when I have actual cash to do so – with food, it also comes down to stretching portions and sometimes sharing. My friend and I had those plates and, despite the fact that it may have been the best cottage pie we’ve ever crafted, did not go back for seconds. We rarely do, actually. Instead, she took home about half of what was left in the pan for at least three additional meals in the next several days, and I have the other half. I had one portion at lunch in the office yesterday and the rest will enhance my weekend by dint of improving with age, flavours insinuating themselves upon each other in an almost immodest way, not to mention less cooking. When food is this good, leftovers are far from boring and something of an extra treat. So, it’s for the same reason I make two loaves of Comfort Diner meatloaf (which freezes well) at a time and a double recipe of Jasper White’s lobster and corn chowder. Stuff’s damned tasty, and less work for me! This was one of Pop’s favorites when traveling in the UK. It wasn’t a dish we made at home. I remember being with him, making notes in a pub below Trafalgar Square on seeing his great pleasure at eating a cottage pie, i riffed on what I could do to make a dish like this my own. Curry in the meat, raisins maybe for a bit of sweetness and say “oriental” take on it. And yes, I’m trying hard not to become mesmerized ! Enough of this ! Off to the pool ! Good for you lalo! The Will Power trick ! A dish like that, for me, is only when i’m feeding a big group. I like the idea that you make ‘m tho! Certainly do! Everything must smell good in that kitchen! And it sounds like you share them with lots of appreciative guests. That’s a good thing. Do wish we all worked at your office sometimes if nothing for all the goodies you make!